Built for speed, the Bandit 2.0 is a light-weight metal softball spike. Don't let the light-weight design fool you. The Bandit has the quality you expect and the durability that Ringor softball cleats are known for. 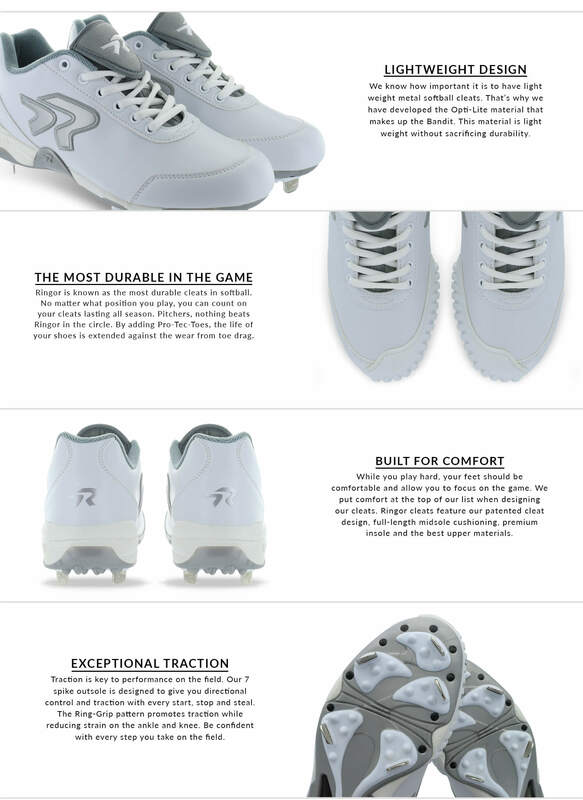 No other metal softball spikes on the market deliver such a fastpitch-focused pair of shoes with such a lightweight design. Read the PRODUCT REVIEWS to see the comments on durability and comfort. Stealing bases will feel great in these shoes. Want to know the difference between the Bandit 2.0 Spike and the Dynasty 2.0 Spike? Click here for a comparison. The cleats are great, and really hold up. We were going through 2-3 pairs in a year. Since we bought these cleats the only reason to buy another pair is bigger size. I would highly recommend. Great fit also. My daughter is very picky on cleats and she absolutely loves how they feel and how well the pitching toe holds up - absolutely the best clear I have bought her! Simply the best.... My daughter is a pitcher and she would wear out the toes of cleats. Then we found Ringor. No more buying multiple pairs of cleats during a season. Ringors are made to last and the pitching toes are the best in softball. Great shoes...stable..... solid..reliable. Comfortable righteous of the box. My daughter loves them.!!! It's too soon to know how long these cleats will last. My daughter has had a few pairs of the Dynasty with pitching toe. We decided to try these, she's just used them a few times, and she has noticed that they are lighter than her other cleats, and says they feel more comfortable. 4 stars for now, we'll see how long they last. Best cleats I have ever worn! They last so long and are grey quality! Definitely worth the money!